The Harman Kardon Sabre SB35 sound bar redefines what a home entertainment system should be, in a modern form, function and design. With an ultra-thin, 32mm, aluminum-finished sound bar and a compact, companion subwoofer, the Sabre SB35 makes bulky audio equipment look and sound entirely passé. With custom developed Harman Kardon drivers tuned to perfection, and maximum processing power for the latest audio technologies, the Harman Kardon Sabre SB35 doesn’t just look the part – it sounds it as well. Enjoy a rich, multi-channel listening experience for your home entertainment system. With one quick and easy install via HDMI®, let the new Harman Kardon Sabre SB35 upgrade your entire home theater experience to the level of cutting-edge. 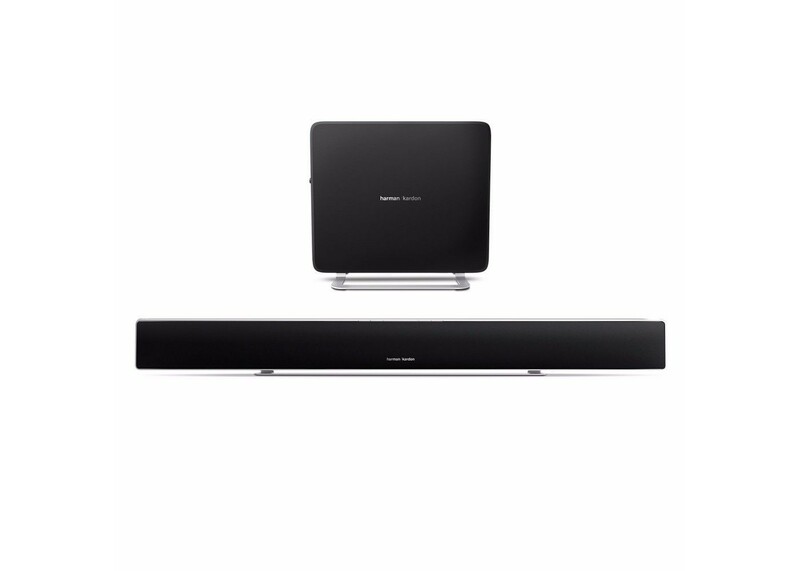 Set-up and manage your system through its easy-to-read, on-screen display, stream music via Bluetooth® from your smart phone, and savor how the Harman Kardon Sabre SB35 can enrich both the look and the sound of your living room. For all its physical unobtrusiveness, the Harman Kardon Sabre SB35 meets – and surpasses – your highest expectations of audio clarity, depth, and calibration. See what Harman Kardon custom speakers can do for your favorite movies and music. There’s a reason we call it the Sabre: its cutting-edge technology is designed into an ultra-thin aluminum frame that fits comfortably above or below your flat-screen television: the perfect pairing of sound and vision. Immerse yourself into one of two possible, built-in Harman surround sound options. Whether you’re more in the mood for Harman Virtual Sound or for Wave Sound is your decision: either way, you’ll be hearing at the highest-ranked levels of 5.1 natural sound processing. Connect the HDMI cable to the television and set up the Sabre SB35 from the comfort of your sofa. Sabre SB35’s On-Screen Display protocol makes set-up simple and easy-to-follow. No more searching for hidden buttons – just grab the remote and make yourself comfortable.